Rules, Scoring, Strategy and anything related to classic games! Qwirkle, sometimes known as Quirkle, is a tile-based game designed for kids. This Canada-designed game has won multiple awards thanks to its fun and intuitive game-play, and despite being designed for a younger audience, even adults can enjoy this unique experience. This game is designed to be played by 2-4 players. All you need to play is the official Qwirkle set, which includes 108 tiles. The standard Qwirkle instructions are provided below. Each Qwirkle set comes with 108 square-shaped tiles. The tiles have a black background, and have a shape printed onto each tile. Each tile is differentiated by their shape and color. Altogether, there are 6 shapes and 6 colors. At the start of the game, all tiles are placed in an opaque bag, obscuring them from view, as influenced by Scrabble. Each player takes a seat on one end of the table. The tiles begin the game in a bag, obscured from view. Each player draws 6 tiles each. The player that goes first is determined with each player calling out the longest chain they can make. The gameplay in Qwirkle is similar to Scrabble, where players make chains, analogous to words in Scrabble. Chains in Qwirkle can go vertically and horizontally. Any number of tiles can be chained so long as they share a similar attribute. For example, a chain of circles can be made with circles of a different color. Chains can also be made using different shapes, provided the tiles share the same colour. In Qwirkle, chains can crossover, just like words in Scrabble. This happens when two different chains use the same tile. 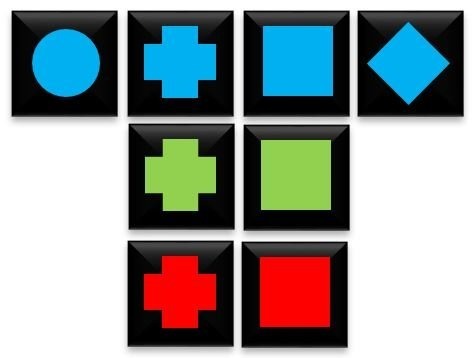 An example of a cross, and variations of the same cross with the same tiles are shown below. Figure 4. The first player plays a chain of blue tiles. The next player then chains crosses using the blue cross already on the board. Note that you cannot use two of the same tile in a chain. An example of an invalid chain is shown below. Chains are important in scoring. This is described in the Scoring section of the guide. 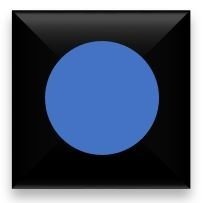 The longest possible chain has 6 tiles, since there are 6 colors and 6 shapes. These chains are known as qwirkles, and bonus scores are awarded. The player who can make the longest chain begins first. For each tile used, the player has to draw a tile from the bag. Essentially, each player should always have 6 tiles in hand. The only exception to this rule is during the endgame, where there are no tiles left in the bag. Each following player will need to extend the chain either by creating new chains, or by extending existing chains. If a player is unable to play tiles, they are allowed to discard any number of tiles, and draw the same amount of tiles from the bag as a replacement. Once the bag is depleted of tiles, and a player has cleared all tiles from hand, the game ends. Points are calculated, and the player with the highest score wins the game. The Qwirkle rules exist to ensure smooth gameplay and strategy. Players are allowed to extend chains that are already on the board, provided the chains are not Qwirkles that are 6 tiles in length. Players are also allowed to extend chains in the following way, and will be awarded points as if they have extended more than 1 chain, with each extension being scored accordingly. Figure 6. Example of extra chain extending. The player places 2 squares to extend the square chain, but also extends the green chain and the red chain, adding to his score. All tiles are hidden in the bag. Each player draws 6 tiles each. If a player is unable to play tiles, they can replace tiles by discarding. The game ends when the bag has no tiles, and a player has cleared all tiles from their hand. Qwirkle scoring is based on the length of chains made. For example, Player 1 begins the round by playing a chain of length 4. This awards him/her 4 points. Player 2 then chains two tiles from the original chain. This makes a chain of 3, awarding Player 2 3 points. Player 1 then plays 2 more tiles in a multiple extension play. This awards player 1 3 points for the chain of 3, and 2×2 points for creating 2 chains of 2. Each Qwirkle will be awarded a bonus of 6 points. Another good rule to follow is to take Qwirkles whenever possible, since they award the highest amount of points. 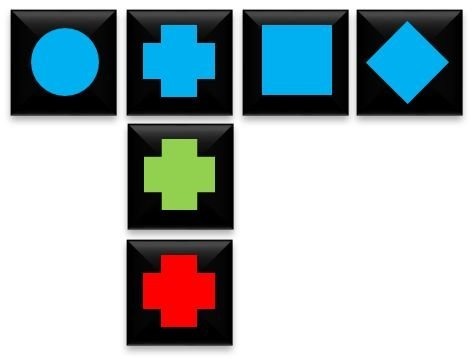 Remember that there are only 6 colors and 6 shapes in Qwirkle. Qwirkle is available in most toy stores, and can be bought at online retailers such as Amazon and eBay. 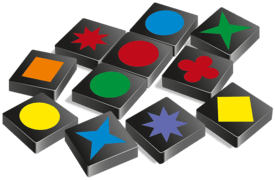 Can you play Qwirkle online? Yes. Qwirkle can be played online on multiple online simulators, but most they do not support play with real players. Another option is to play on the official Qwirkle App. Are there variations to Qwirkle? Qwirkle Cubes was released by the original manufacturers and designers in 2009, and uses cubes instead of tiles, adding a layer of dimension to the game. How long does a game of Qwirkle last? A game of Qwirkle lasts 45 minutes at the max. Cool Old Games is a collection of guides on rules and strategies for traditional games. Any game up to the early 2000s is considered ‘classic’ by us.